Who are Rick Scott and the Republican-led legislature working for? Not us! That’s for sure. As Florida’s legislative session is happening, it comes as no surprise that Governor Rick Scott and the Republican-led Legislature have a jam-packed agenda that attacks hardworking Floridians rather than doing their sworn job to protect the interests of our most vulnerable. Instead of addressing the real issues that affect the lives of millions of hardworking Floridians, like increasing the state’s minimum wage to $15 an hour and expanding access to affordable health care to protect more families from falling into poverty, Gov. Scott and his allies are choosing to grow corporate welfare by proposing a $770 million tax-cut for big business at the expense of taxpayers; attack hardworking immigrants and separate families with 7 anti-immigrant bills; and, amend the Constitution to deny State workers the ability to collectively bargain -- one of the simplest examples of democracy. Enough is enough! We need a state Governor and a legislature that cares about the struggles of hardworking Floridians like us that keep this state healthy and thriving. Raise the minimum wage! (Support Senate Bill 6/House Bill 109) Too many hardworking Floridians don’t earn enough to support their families because they are underpaid and underappreciated. 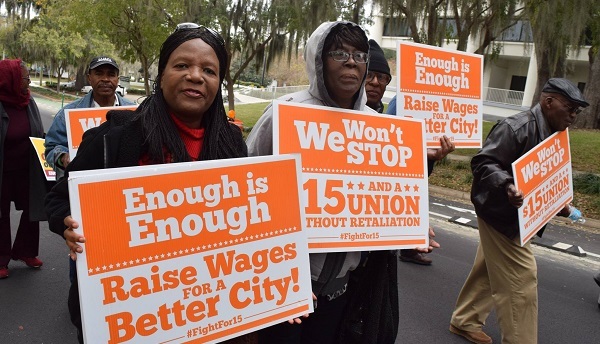 It’s time for our politicians to rise to the occasion and raise the minimum wage to at least $15 an hour, which will benefit more than 4 million Floridians. Expand Medicaid to cover 600,000 Floridians (Support Senate Bill 856/House Bill 629) Hardworking Floridians need it and the money is there. Last year the Senate voted to receive the funds offered by the Federal government to pass health care expansion to provide health coverage to those most in need, but the House said no. We will keep fighting this year until thousands of Floridian families access the health care coverage they deserve. If Rick Scott and the Republican legislators choose the path of boosting corporate welfare, hardworking Floridians will have more incentive than ever to vote this November for candidates who will cut off the funnel of money that continues to subsidize some of the state’s largest corporations and invest that money on the real economic engine – working Floridians.